Every day the wrestlers walk in to see the following words painted on the walls of the wrestling room: “You walk into this room only a boy… with hard work and dedication, you WILL become a man.” These words have the intentions of inspiring young boys; what BHS didn’t know is that these very words would have a completely different meaning to girls eager to join the team, more specifically, Long, who is eager to make history. Long is anxious to begin paving the way for future girl wrestlers at BHS, as she prepares for the seasons to come, the meets to follow and matches to win. Long’s journey dates way back to her fifth-grade gym class where a simplistic single sheet of paper launched her ambition and sparked her desire to begin wrestling. This very piece of paper would then be taken home and discussed with her parents about the future she would soon delve into. Batavia Pinners Wrestling Club is where Long learned an extensive set of techniques and skills. At “kid’s club” she wrestled Riley Woods, a pronounced and skilled wrestler that challenged Long’s abilities. It is thanks to “kids club” that today Long has a confident outlook on her being a girl wrestler. Overall her success in “kid’s club” resulted in winning four consecutive state championships and her national ranking climbing significantly. During Long’s freshman year of high school, she took a break from her wrestling career as she realized she had been exhausting her mind and her body beyond its limits for all the wrong reasons. She found herself not wrestling for herself, yet wrestling for others’ gratification instead. What was a very needed break helped Long refocus and center her mind and body to flourish and thrive to her full potential, she said. As Long’s long hair rests on her shoulders she fidgets with her hair tie in her hands. Effortlessly, her hair is tied into a tight ponytail as her shoes hit the soft black padded mats covered in an endless array of faded yellow circles. Her footsteps leave embedded imprints as she walks confidently to the center of the mat, ready for the challenge of jumping back into her passion once again. Her sophomore year, Long switched schools, moving from Aurora High School to BHS. Out on the mats is just you and your opponent, the world falls silent and to calm the nerves rushing through your head, you remind yourself “…just wrestle how you wrestle”. 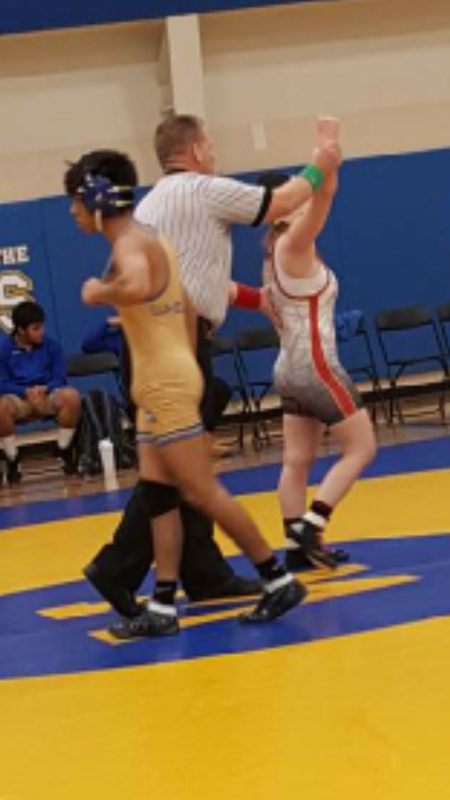 When you check back into reality, the ref raises your hand into the air and suddenly the silence that previously had calmed you erupts into a loud chaos of cheers and applause from family, friends, and teammates, as you realize you just won your match for Batavia. The respect and love is mutual when it comes to the wrestling team at Batavia. Long expressed the relationship she holds with many of the senior varsity boys. As Long continues her wrestling journey for the next two years she has high expectations of herself to fill the boy’s shoes and to make them proud. Not only does Long receive love and support from her teammates, but she also gets encouragement from her coaches. Many people in Long’s life would say that they are proud of her for the accomplishments she has made throughout her wrestling career. Long, views her wrestling career as “just getting started”. She strives to keep making her mom proud who continuously attends all her daughters meets. Batavia has not seen all of what Long can do yet. She has two years left here at Batavia High School in those two years Taylin Long will have the opportunity to thrive even more. She is eager to reach her full potential and is encouraged not only by those closest to her but in fact the whole community to do exactly that. “People haven’t seen what I’m capable of,” Long said.